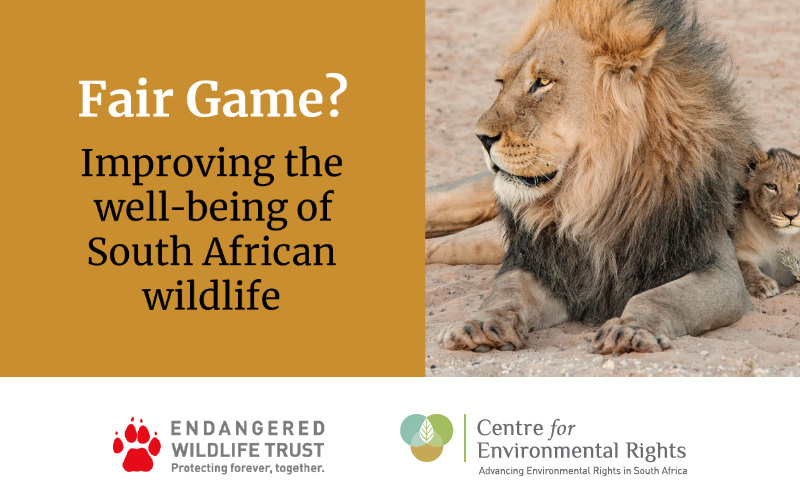 In a joint report published today, the Centre for Environmental Rights (CER) and the Endangered Wildlife Trust (EWT) set out findings of a review of the regulation of the welfare of wild animals in South Africa. The report, entitled Fair Game? Improving the Regulation of the Well-being of South African Wildlife finds that there are major gaps in both legislation and the implementation of those laws, leaving the well-being of wild animals without adequate protection. The organisations recommend the clarification of the legal mandate for wildlife welfare, and the updating of legislation. They also call for greater investment in compliance monitoring and enforcement, and a standardised and transparent permitting system for activities involving and affecting wildlife. Historically, our regulatory system has distinguished between animal welfare on one hand, and biodiversity conservation on the other – and regulate those separately in different laws. This means that conservation laws applicable to wild animals under the physical control of humans, whether held temporarily or permanently – are often unsuited to addressing the issue of welfare of those wild animals. Welfare laws, on the other hand, do not necessarily consider conservation objectives. To make matters worse, both sectors suffer from very limited resources for compliance and enforcement. In practice, the current legal regime ultimately provides little protection for wild animals. South Africa has, in recent years, seen a proliferation of facilities that involve the captive management of wildlife for commercial purposes. The legislation that governs the welfare of these wild animals has not kept pace with the rapid changes in the wildlife industry. As a result, the welfare of many species of wildlife has often become compromised. Welfare standards that may be suited to domestic animals cannot be considered suitable to the full spectrum of species of wildlife. Media reports of the practical state of welfare protection for wild animals in South Africa demonstrate the need for urgent reform in laws and practices. For example, an incident in 2014 involving the death of a giraffe while being transported in an open-air truck on a national highway drew great public concern when the driver drove under a bridge that was not tall enough for the giraffe to safely pass under. No prosecutions for this grave incident have been reported to date. More recent examples include dozens of neglected and starving captive lions on a Limpopo farm and a lion “abattoir” in the Free State housing over 200 lions awaiting slaughter for lion bone exports, currently in limbo as both the Departments of Environmental Affairs (DEA) and the Department of Agriculture, Forestry and Fisheries (DAFF) say that the welfare situation is not their responsibility. In addition to this, the increase in reported incidents of captive carnivore attacks on people, many resulting in fatalities, are not being legally addressed. Each of these incidents, a small fraction of those going on country-wide, represents a failure of the system in protecting the animals. Whilst regulations may exist for the captive management of some selected species, and laws may be in place to regulate the numbers being traded, the welfare of captive wildlife, and the mandate of the authorities to monitor compliance, is currently insufficiently protected. The joint report was prompted by growing concern amongst civil society and NGOs, including the EWT and the CER, about the absence of welfare considerations in conservation laws and practices, and the fact that existing welfare laws do not adequately cater for wild animals, which are increasingly the subjects of breeding farms and other forms of intensive management. The report examines the legal and practical regulation of the welfare of wild animals in South Africa with a view to constructive engagement with the national and provincial departments charged with implementing both conservation and welfare laws, and other relevant stakeholders, with the aim of reform. “In order constructively to address the gaps and shortcomings in the legal framework that governs the well-being of wild animals, the EWT and the CER embarked on a process of identifying where and how the laws should be changed. Broad consultation with a large number of stakeholders in the commercial wildlife industry, welfare sector and government has strengthened the findings and recommendations. The report thus provides a positive platform from which the relevant government authorities can now address the dire need for vastly improved welfare governance for our wildlife,” said Yolan Friedmann, EWT CEO. Importantly, the report also places the issue of wildlife welfare in a Constitutional context. The report argues that the improvement of welfare laws, as recently confirmed by the courts, and their consistent implementation, compliance, monitoring and enforcement is an urgent Constitutional imperative. The report concludes by providing legal and practical recommendations for the improvement and proper regulation, compliance with and enforcement of good minimum welfare standards for wild animals under the control of humans. These recommendations serve as a catalyst to open discussions with and tender assistance to the relevant government and legislative bodies for the improvement of wildlife welfare laws and practices. These include the national Departments of Environmental Affairs, Agriculture, Forestry & Fisheries; provincial environment departments and conservation agencies, and provincial agriculture departments. Section 24 of the Constitution guarantees everyone the right to an environment that is not harmful to their health or well-being and to have the environment protected, for the benefit of present and future generations, through reasonable legislative and other measures that prevent pollution and ecological degradation; promote conservation; and secure ecologically sustainable development and use of natural resources while promoting justifiable economic and social development.